As I mentioned before, we got access to the Star Alliance Lounge at LAX due to a twist of fate that saw us flying Business Class on Singapore Airlines from Los Angeles Tokyo. Score! What better way to fly a long haul international flight than on business class? Ok, my husband would probably say Suite Class on Singapore Airlines, but that’s just getting greedy. Anyhow, on Singapore Airlines, when you book Premium Economy class or above, you get access to something called “Book the Cook,” which means that you can choose from a wide selection of chef-prepared meals for your flight prior to boarding the flight. This way, you’ll always know in advance what to expect when you fly, and you get food that is of your own choosing. 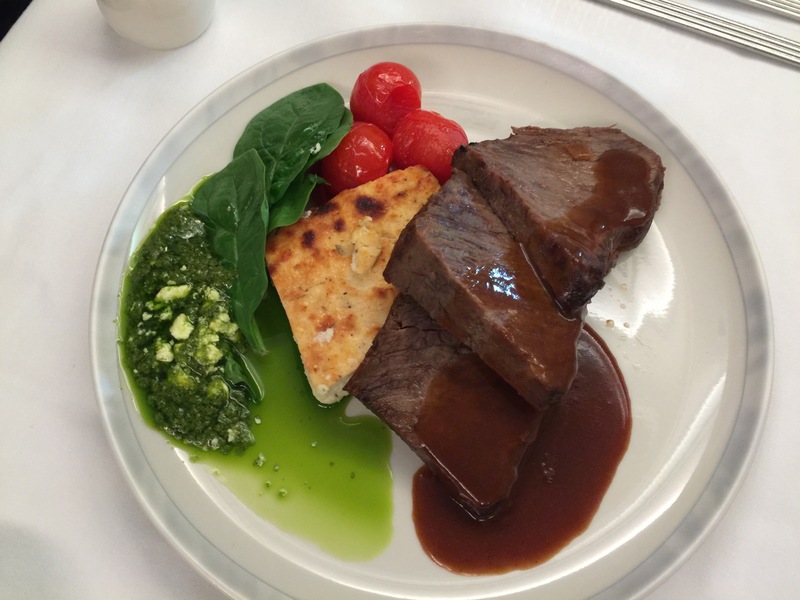 And these chef-prepared meals are impressive first class meals. First off, upon boarding the plane and finding our seats, we were offered refreshments. 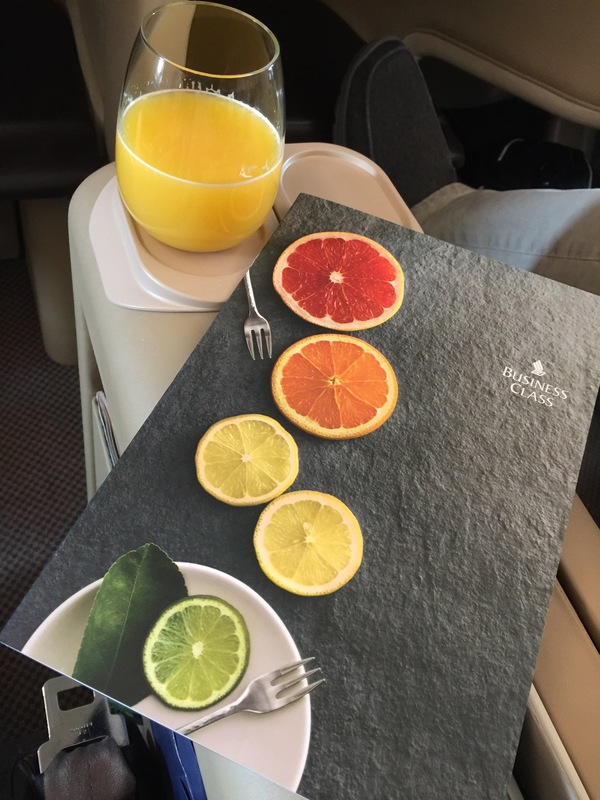 I chose a glass of orange juice while I browsed through the extensive Business Class menu for our flight. And this was a menu, or rather a booklet. Page after page of delicious food offerings described in detail and course by course along with a wide selection of drink options. And yes, I said course by course. Each meal we were presented with was a multi-course meal. Definitely nothing of the variety of economy class where you’re only presented with a tray with multiple little plates on them that constitute your entire meal. 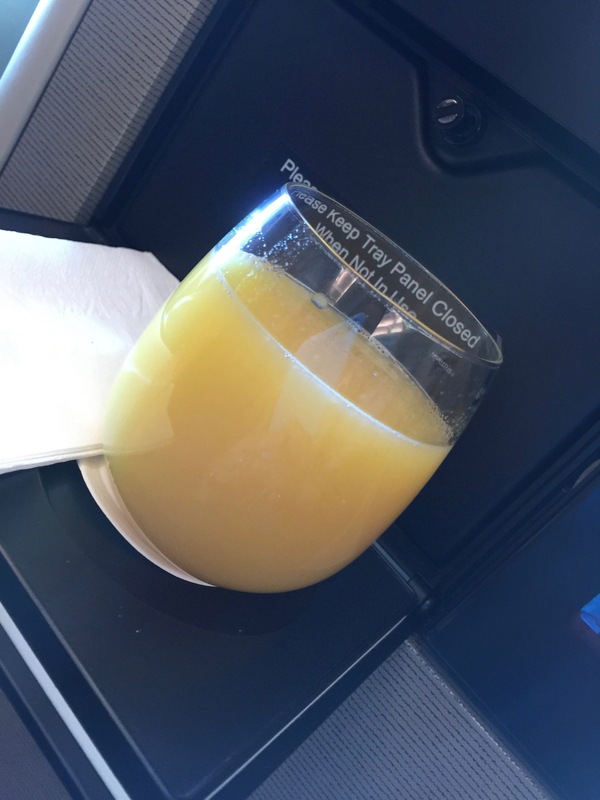 Even though each passenger was offered drinks and refreshments prior to take off, a flight attendant also came around to each person to take a drink order from their wide drink selection that would be served to us just after take off. Along with the drinks, we were given these little bowls of premium nuts. The bowl was nice and warm, like the nuts had just been heated/roasted through the oven prior to serving. If you know me, you know I don’t like nuts at all, but surprisingly, these warm cashews, almonds and who knows what else nuts somehow tasted so much better served nice and toasty warm like this that I found myself picking through the little bowl until I finished off my whole serving of nuts. Crazy! My drink selection was their featured drink mix (non-alcoholic) called Sunrise Meadow, which they described as “a refreshing mix of orange and pineapple juices topped with soda water.” However, this drink list we had to choose from was so extensive it was impressive. There was a selection of expertly selected champagne, red wine, white wine and ports onboard for our selection. The fully-loaded bar could also supply us with a number of handcrafted cocktails, including Singapore Sling, Bloody Mary, Screwdriver, Grand Pineapple Daiquiri, Silver Kris Sling (Singapore’s version of A Singapore Sling), and a number of other cocktails. Included was also a selection of spirits such as Chivas Regal Scotch Whisky, Highland Park Warrior Series Svein, Absolut Vodka, Bombay Sapphire Gin, Imayotsukasa Junmai Sake, Guinness Stout, Grand Marnier Cordon Rouge, and Johnnie Walker Black Label Whisky among other choices. Of course, there was also a wide selection of non-alcoholic juices and sodas as well as a wide variety of illy coffee drinks and a large selection of 1837 TWG Tea. After being in the air for about an hour, the air stewards came around to prepare for dinner service. 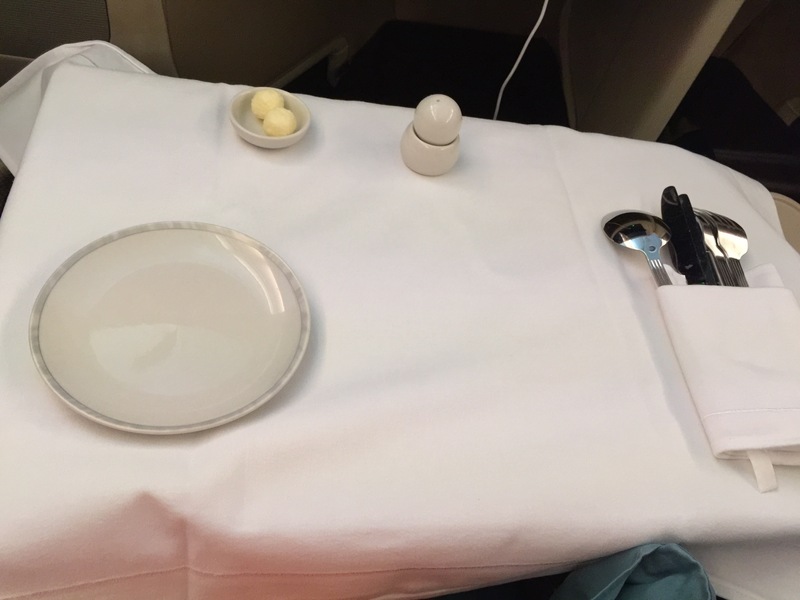 Amazingly, when you are seated in Business Class, dinner service doesn’t just mean a choice between chicken or beef and an all-in-one tray set before you. Rather, you get personalized service from the air stewards as they come by each seat and actually set your dinner table for you. A white linen cloth is laid out before you and your table is set with a salt and pepper shaker, a dish with butter balls, a fine China side plate and beautiful silverware. It’s classy, and maybe because this was my first experience with this, I was totally surprised. Shortly thereafter, we were all served the first course of our meal. 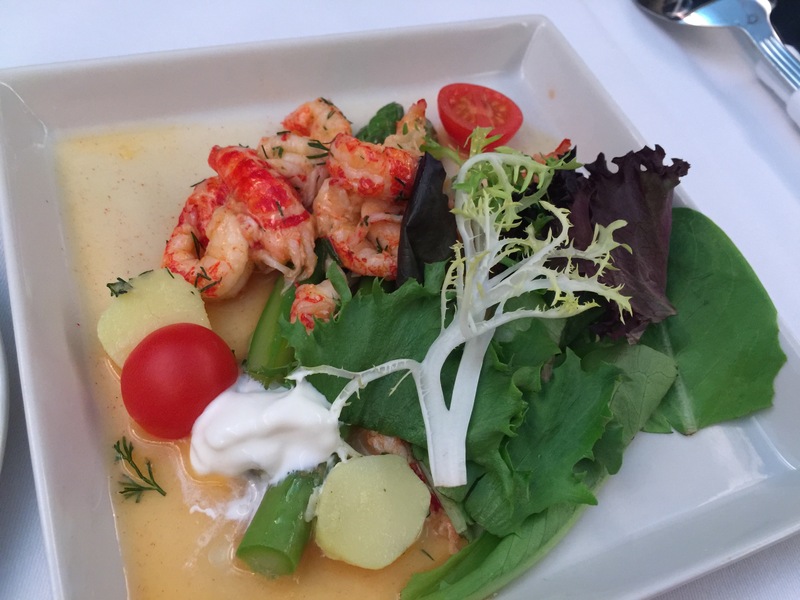 Everyone in Business Class received the same first course start of marinated crayfish with citrus dressing served with asparagus, dill potato, tomato and mesclun leaves. And boy, oh boy, did this starter look amazing. 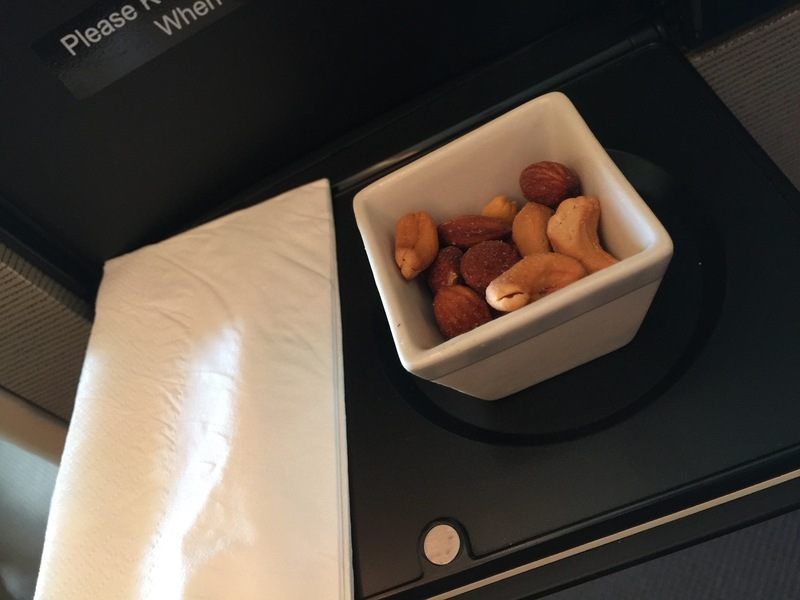 I’ve never seen anything like this served on a flight before. I guess this is the perks of flying something other than economy class. I’d never had crayfish before, and this was so delicious. The citrus dressing was perfect for the crayfish and the salad and potatoes and asparagus were so good. 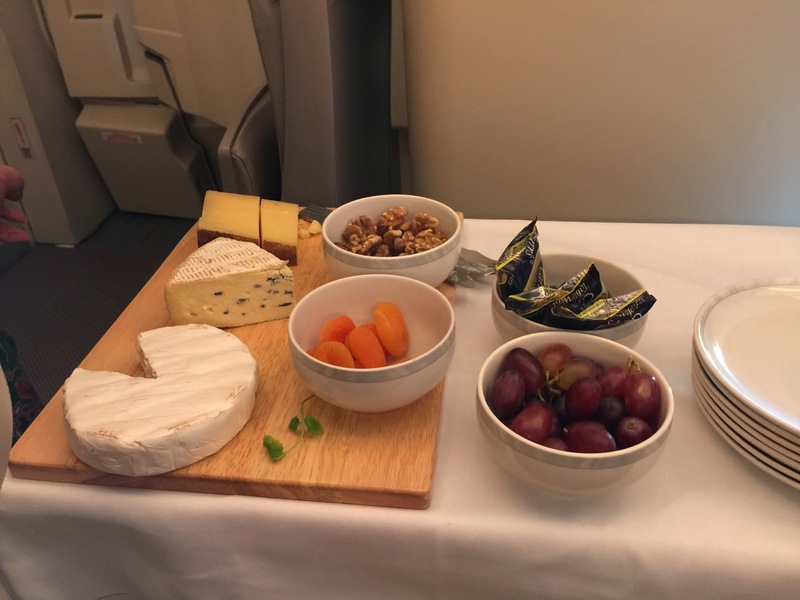 Food on a plane that you can actually eat and enjoy, such a novel concept. Next, our entrees were served. Again, since Singapore Airlines has their “Book the Cook” program, you can go online and choose your meal before you ever board the plane. Wanting to eat something I could actually enjoy, both my husband and I pre-ordered our meals. Plated and served on a fine china plate, I ordered the braised beef short ribs with roasted potatoes. 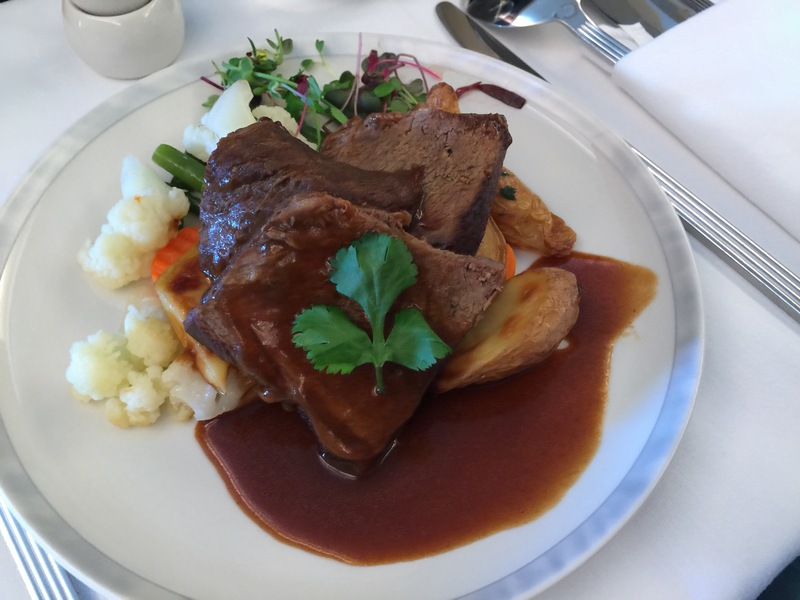 As the menu described, it was braised beef short ribs in a red wine sauce served with fondant fingerling potatoes and buttered seasonal vegetables. The dish was so delicious and incredibly filling. The short ribs were tender and fall apart with a fork. The red wine sauce was fantastic and flavorful and the fingerling potatoes were fluffy and tender. I’ve told you before, I’m a meat and potatoes kind of girl, and this meal really hit the spot for me. Other entree options for our flight included items such as lamb biryani with atchara (pickles), fried onions and cashews, or a Singaporean favorite of nasi lemak with sambal prawns. How about mushrooms stuffed chicken with mashed potatoes and roasted root vegetables? I loved that they really gave us great options, and the options were wide and varied for every taste as well. My husband ordered the dim sum selection for his meal choice. 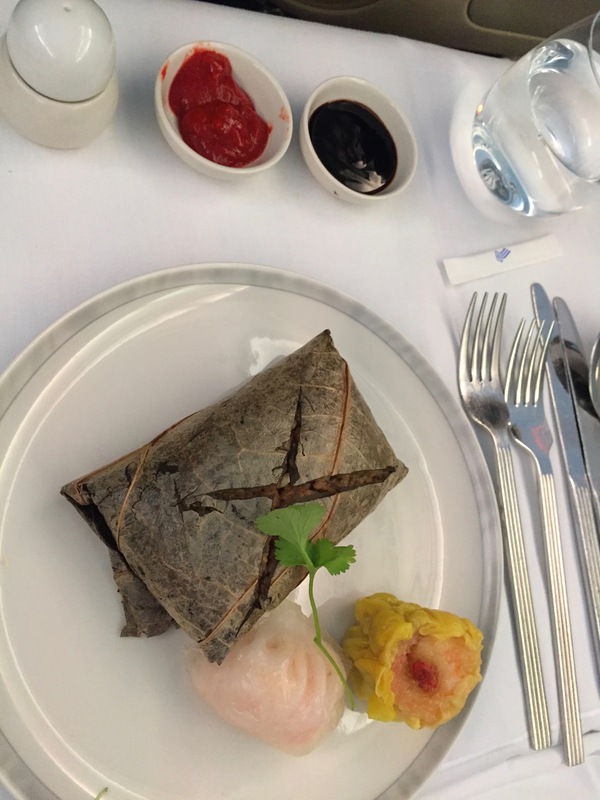 The dim sum selection came with a steamed pork dumpling, shrimp dumpling and lotus leaf rice served with chili sauce and mustard. 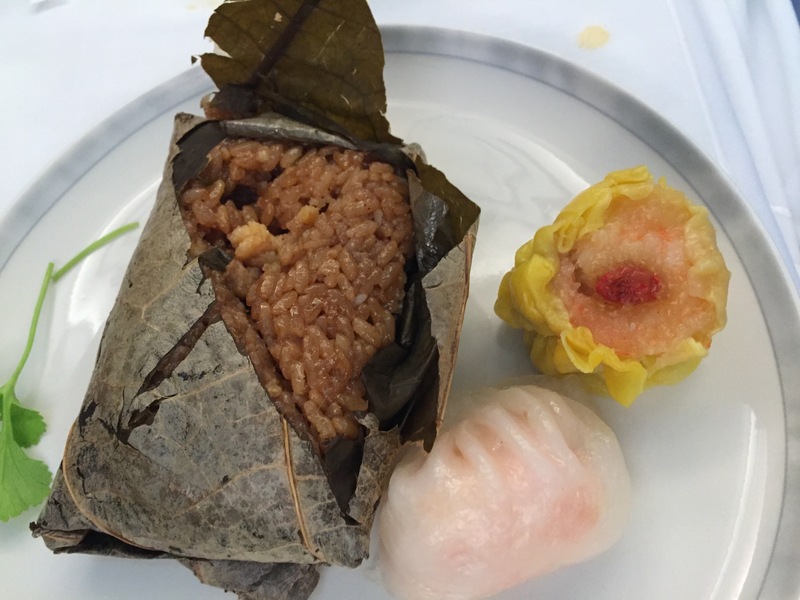 I knew that my husband would enjoy the dumplings, and he did say they were tasty, but his favorite part of the meal was the lotus leaf rice. He said he was incredibly flavorful and different and very filling. Another entree option to choose from was chicken and rice made with a poached chicken thigh with chicken rice and Asian greens or cod fish clam chowder with potatoes, wilted baby spinach, and cherry tomatoes. Chicken, vegetarian, lamb, beef, and seafood were all offered and each dish looked and smelled amazing. But it doesn’t stop there, after our entrees were served, a steward came around with a fresh bread basket. The bread included sliced sourdough, breadsticks, dinner rolls and garlic bread. They’d already provided us with butter on our place setting, but you could also take bottles of olive oil and balsamic vinegar if you preferred that instead. 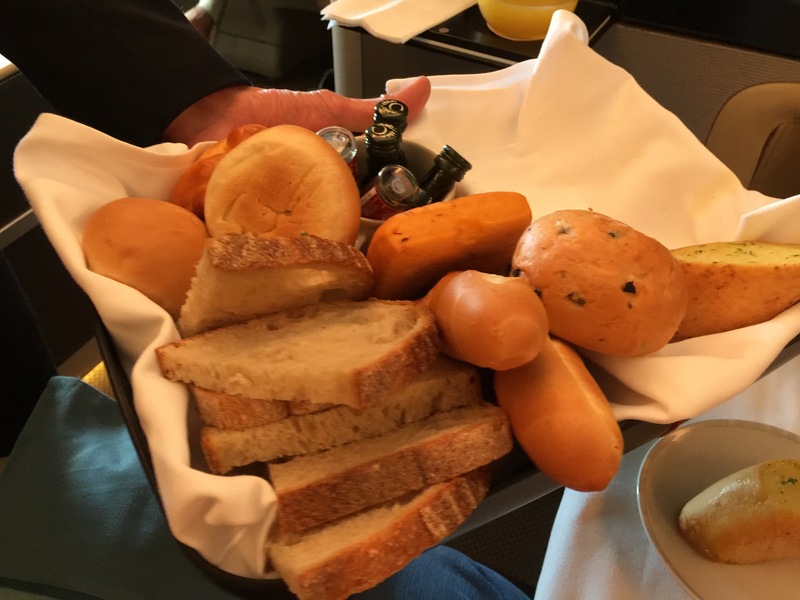 Wow, I’m so used to just having a dinner roll plopped onto my food tray on the plane that the idea of a fresh bread basket was exciting to me. 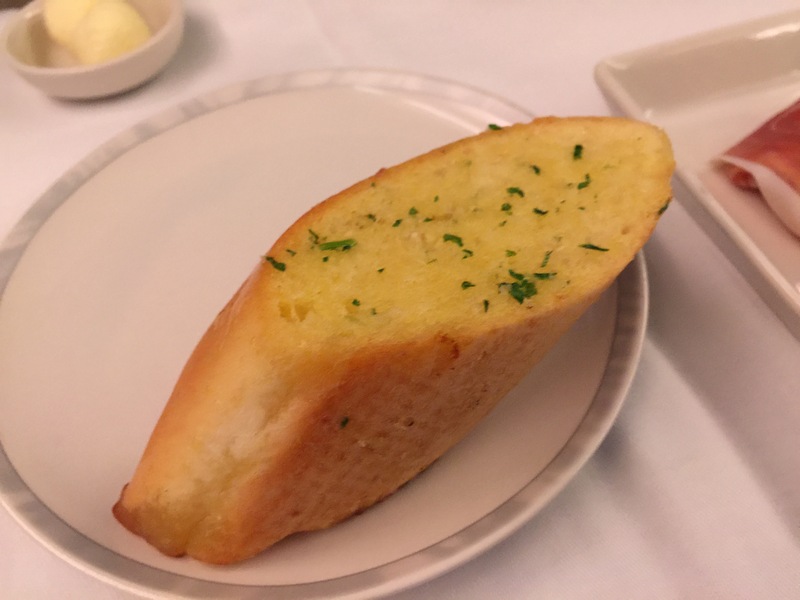 And my garlic bread was delicious. Once the meal was consumed, the plates were quickly cleared away, leaving a clean place setting in preparation for the next course. 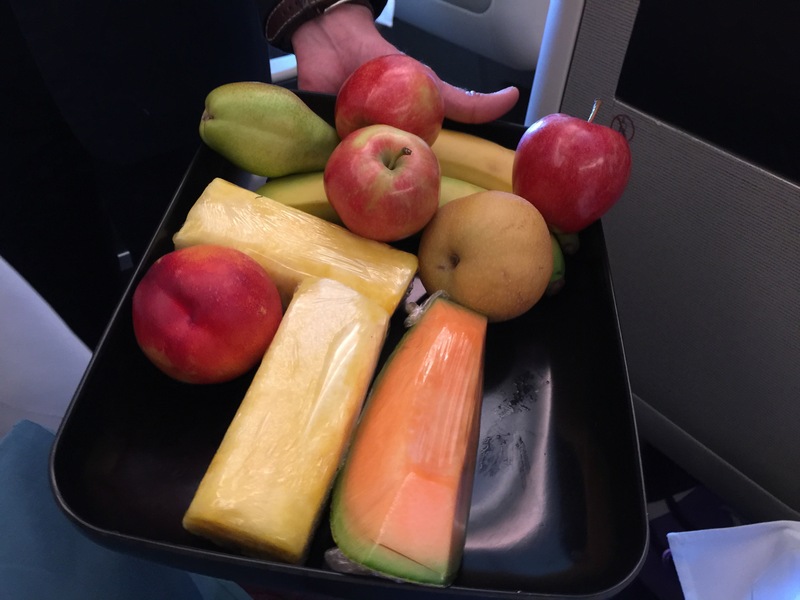 A fresh fruit tray was presented to each person. The fruit offerings included fresh sliced spears of pineapple wrapped in saran wrap, fresh sliced cantaloupe also wrapped in saran wrap, apples, pears and bananas. I couldn’t help but choose the fresh cut cantaloupe. It was so yummy and delicious. Along with the fruit offering, a cheese cart was wheeled around as well. For those who wanted cheese (and it wasn’t like you had to choose between one or the other, you could have cheese and fruit!) 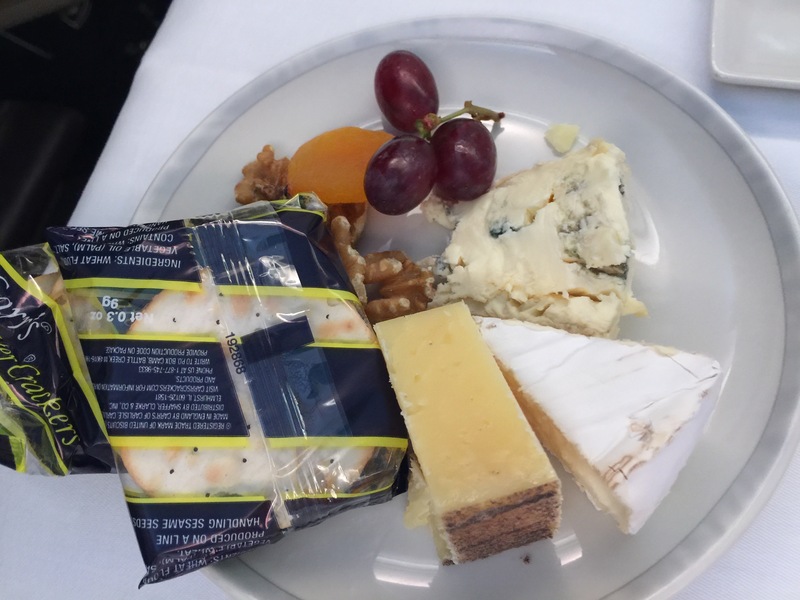 a whole plate was prepared with 3 different types of cheese, including a blue cheese, brie and a hard cow’s milk cheddar cheese along with walnuts, dried apricots, fresh grapes and crackers. It was all so fancy and sophisticated. My husband, the cheese lover, of course had to get the cheese plate even though he was already full from dinner. And finally, it was tine for dessert. Yes, yet another course to our meal. Dessert was a yoghurt cranberry cake with creme anglaise and a fresh raspberry. Being that I am not a yogurt lover, I was going to skip dessert all together, but then I couldn’t bring myself to decline the cake. So, I tentatively took a bite and was surprised to discover that I really liked this cake. It was quite light and tasty, not too sweet, and the cranberry added a hint of tart and tang to the cake which was perfect. Wait, you thought this was it? 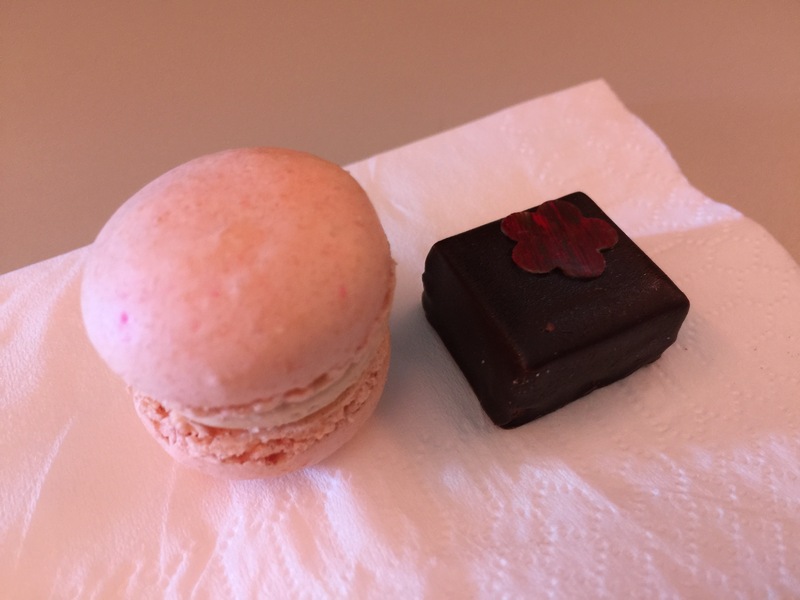 Nope, at the very end of the meal, we were also served petit fours in the form of a mini French macaron and a chocolate praline. Wow! What a meal. Incredibly delicious, very filling, and so many courses, it was hard to keep track of. I’m not sure I’ve ever eaten more food on any flight ever! A few hours after our first meal service on this flight, the stewards walking around carrying a basket full of goodies they were offering as snacks before we received our second meal on this flight. While on past flights, sometimes snacks consisted of a tiny package of pretzels or cookies, or sometimes on long haul flights, I’ve gotten a small single serving size cup of ice cream. But here, these snacks were no joke. 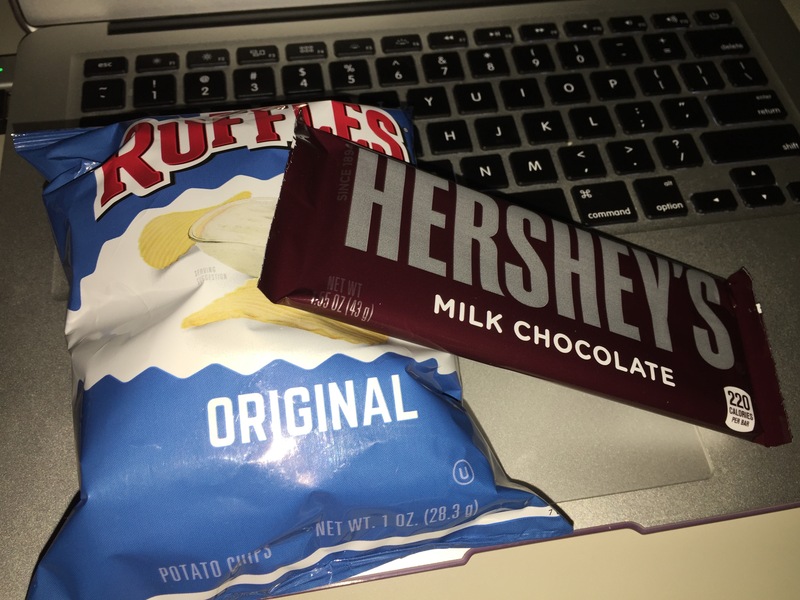 I actually was able to grab a full-size Hershey’s chocolate bar and a full size bag of Ruffles. There were other options as well, but my eyes bugged out at the potato chips and the chocolate bar that I didn’t get a chance to focus on what else was being offered. A couple of hours before landing in Tokyo, we were offered a second meal. Again, our trays were set with a table cloth and fine silverware and salt and pepper shakes and fresh butter. 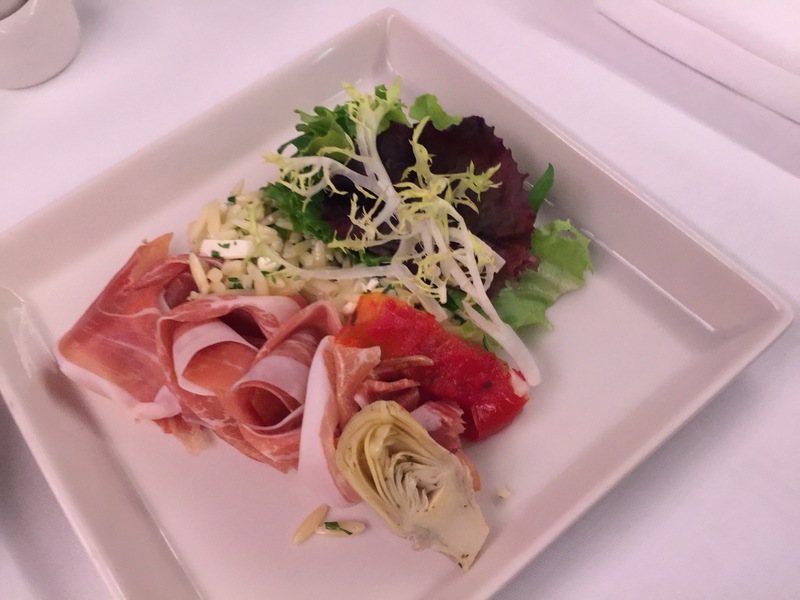 For this meal, our appetizer was one of prosciutto ham with orzo feta salad, sun dried tomato and roasted artichoke. Honestly, by the time this meal was served, I still felt quite full from our first meal of the day. Now when do you go on a flight and say you’re too full to eat a second meal due the previous meal? Most times, flights leave everyone starving from lack of anything good to eat. Anyhow, I couldn’t just let this good food go to waste, and besides, the prosciutto was pretty tasty. Again, my husband and I chose the “Book the Cook” option for this meal. My husband took the braised beef short ribs with roasted potatoes this time around. Slightly different preparation on the short ribs and accompaniments as I had for my meal, but essentially the same meal. However, like me, my husband was also quite full from his previous meal, and you can see that these meals we’re being presented with aren’t tiny meals. For my meal, I chose beef sukiyaki with steamed rice, braised onions, green onions and spinach. Boy, I may have been full, but this dish was so terrific that I couldn’t pass it up. 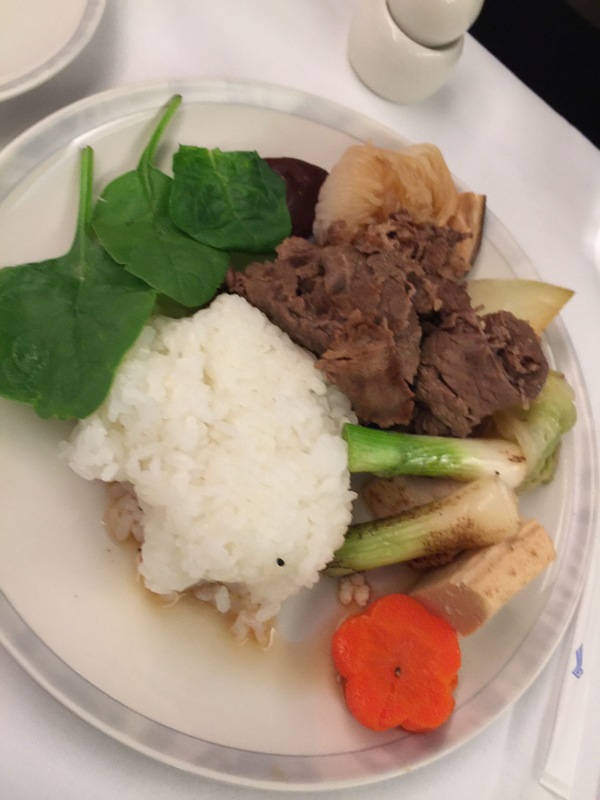 The beef sukiyaki was so tender and thin-cut and delicious. The braised onions were amazingly flavorful and the rice was a perfect accompaniment. I did my best to eat as much of this meal as I could. But boy, they sure were providing us with too much good food. 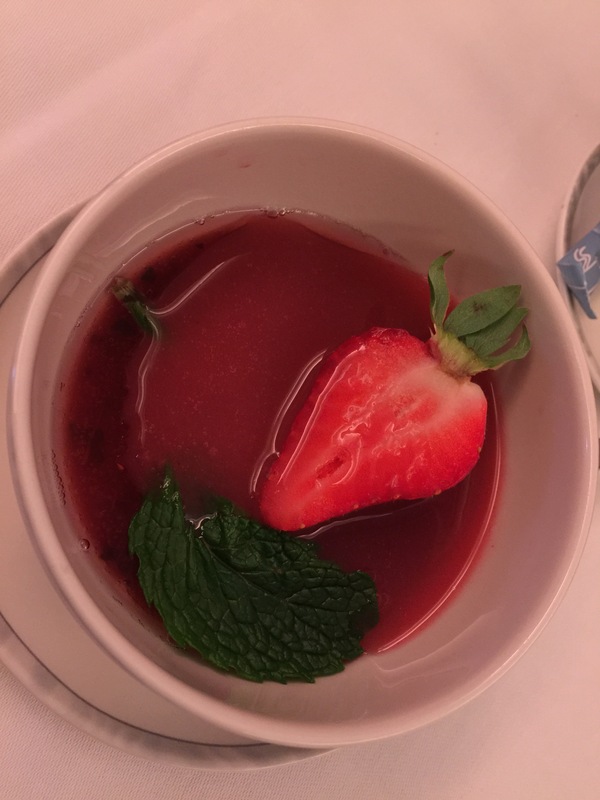 Dessert for this meal was strawberry panna cotta with strawberry coulis with a fresh strawberry and mint leaf garnish. The dessert was sweet, but luckily, not too large so it didn’t get cloyingly sweet. The strawberry wanna cotta itself was tasty and well done. 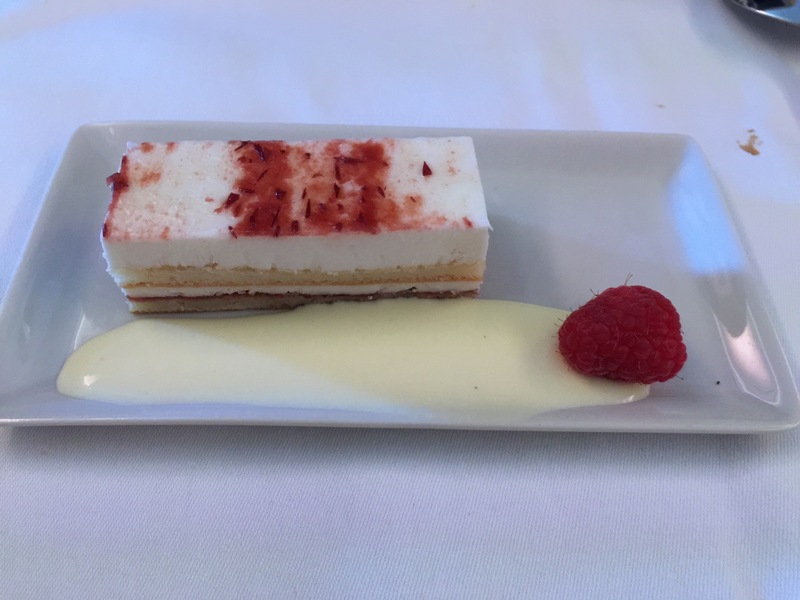 The strawberry coulis was a bit over-the-top though and that’s where most of the sweetness in the dessert came from. I could have done without the coulis, but it was a great dessert nonetheless. And bonus, it was small and light enough that I could actually finish it, even though I was completely stuffed by this point. Business Class on Singapore Airlines is like no other flying experience I’ve ever had. Luxury flying at its best. Book the Cook is an innovative and terrific program that allows each guest to choose their very own meal in advance and I love that the choices are numerous and varied so that everyone can find something they want. The whole dining experience is of a whole different level where everything is elevated – from table clothes and place settings, to different courses being served to you individually, fresh bread baskets, cheese carts and fresh fruit are just a bonus. 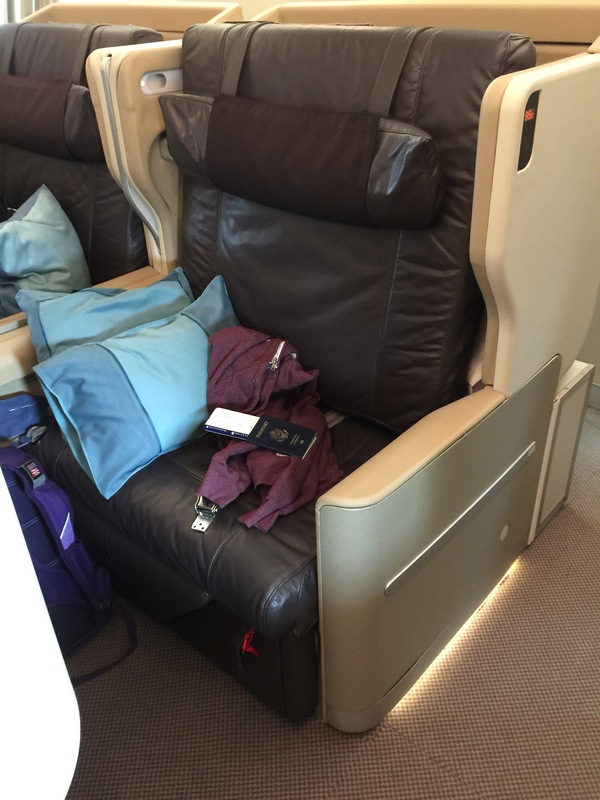 If you ever have a chance to fly Business Class on Singapore Airlines, you should jump on the opportunity because the experience will be unlike any you’ve ever had previously at 40,000 feet in the air.